Company storytelling has become a catch phrase in today’s marketing world and with good reason. To really stand out these days, you need to be remarkable. You need a narrative that resonates with your target audience. For all the current talk about storytelling, though, many companies are still coming up short. If you’re struggling with telling your company’s story, here are three points to consider. Focus on fundamental values. The real value of your company isn’t in your sales figures or even in innovation. It’s in the way you enhance your customers’ lives. The 10-year Stengel Study of Business Growth found companies grew fastest when they were connected to fundamental values such as joy, pride, exploration and connection to others. These are ideals we relate to as human beings. When you set out to tell your story, focus on the human element — the ideals you believe in and the higher purpose that drives what you do. Craft your brand’s persona. People don’t connect with faceless companies; they connect with other individuals. To your customers, your business will take on human characteristics whether you plan for it or not. For better control over how you’re perceived, take time to craft a consistent, memorable, meaningful personality for your company. The personality you create should be suited to expressing your core values and telling your company’s story. Ask for input. Your story guides both major executive decisions and day-to-day work. The problem is the CEO may be working from a very different story than the average customer service rep. For a well-rounded view of your story, ask for input from workers in a diverse selection of roles. Avoid “design by committee” disasters by looking for the commonalities in how your management and employees view the company. Draw from these existing shared views to develop your company’s story. 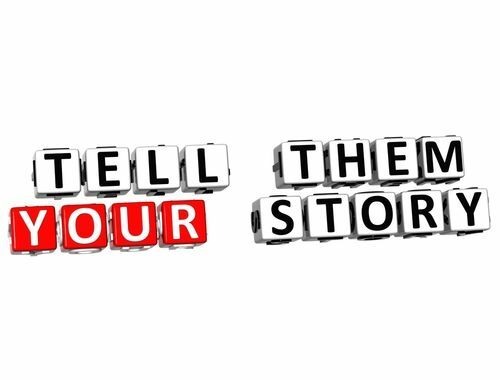 Have you created a compelling, memorable story for your company? If so, how do you go about telling your company’s story to your target audience? If you’re not satisfied with the story you have now, what’s holding you back from crafting a better one?